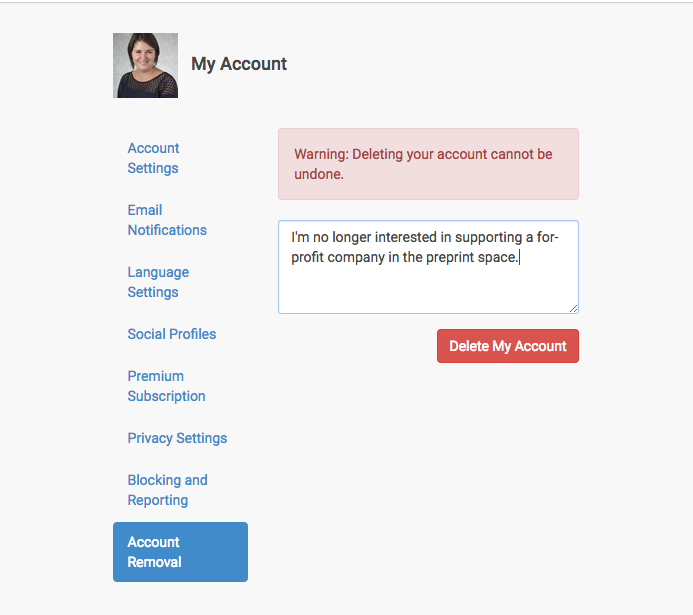 Bye bye, academia.edu and ResearchGate – hello PsyArXiv! There’s lots of stuff I should be doing right now (most imminently, preparing syllabi), but I’ve been meaning to do this for a while. Specifically: I want for-profit companies academia.edu and ResearchGate.com out of my life. Open Access: You want your work to be freely available, even to scholars who don’t have library access and the general public. For most psychology journals, you don’t have to pay an OA fee to make your (un-typeset) work freely available to all. Higher Citation Rates: Work that is made accessible tends to be accessed and used more. PsyArXiv tracks your download counts, and I can confirm that it is weirdly satisfying to see those numbers tick up over time. Indexed by Google Scholar: When people search for your work on Google Scholar, they’ll get directed to your freely accessible pre-print. Link to Published Work: You can assign DOIs to your pre-prints on OSF, and if applicable you can associate the pre-print with the DOI of a published paper. Version Control: With preprints on PsyArXiv, you can easily update your work to the latest version, while simply keeping track of earlier versions. Readers get the latest version – perfect for incorporating corrections and updates. Archive and Preserve: PsyArXiv is hosted by the Open Science Framework, and content there is backed by a $250,000 endowment to ensure your work is stably hosted. Storage on PsyArXiv is designed to be more reliable and longer lasting than storage on your personal website or computer. Supported and Maintained by the Research Community: We researchers already cede too much control of our work to for-profit publishers – why give for-profit entities any leg up at all in the preprint space? This one is easy: I’ll choose instead to support the site that is maintained by my peers**. You can check out this PsyArXiv blog post (and the others) to learn more about the preprint initiative. Post your author formatted copies of your papers on PsyArXiv***. You can check SHERPA/RoMEO to make sure it is OK to post your own copies of your published or accepted papers (it is for most psych journals). The last step is to tell your colleagues and share on social media. I bet if we work together we can give for-profit preprint hosts the boot. Will you join me?